I first saw The 36 Chambers of Shaolin, reluctantly, at the insistence of a friend. I was pleasantly surprised, though, by the meticulous storytelling, the fantastic fitness of Gordon Liu, and the masterful choreography of the fight sequences. 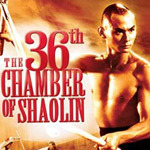 For many, The 36th Chamber of Shaolin is a martial arts classic. It’s one of the first martial arts movies to have played to American audiences, and the filmmaking is good enough to keep it from falling into obscurity. The story is one of revenge (or “justice,” if you prefer). San Te (Liu) witnesses the death of a martyr and vows to learn kung fu so that he can fight the oppressors in his community. Fleeing the bad guys, he heads for the temple of Shaolin. The bulk of the movie shows San Te training endlessly at the temple. First he learns balance by hopping across a floating log on the way to the mess hall (you’re not allowed in if you’re wet). Next he learns strength by hauling water, a bucket at the end of each outstretched arm, to the top of a chute at the laundry. He gains strength and control of his forearms by hitting a gong with a sledge attached to a ten-foot bamboo pole. Years pass as he works his way through the “chambers,” honing his concentration, strength, and reflexes. After what seems like a movie unto itself, he is finally pronounced a master, and invited to teach at any of the 35 chambers. Instead of choosing one, he proposes to create the 36th chamber, which will take the knowledge of Shaolin out of the temple and teach it to the people, so that they can learn to fight for themselves, too. Any beginning screenwriting instructor should be proud to show The 36th Chamber of Shaolin to his class, for everything that is set up while San Te is in school, pays off when he returns to his village. The conclusion features San Te confronting the oppressors who sent him packing in the first act. There are many fight scenes, and each one demonstrates a skill that he learned while in school. He uses his balance to avoid a trap. He uses his wrist strength to fight with a staff (and to correct an ally who doesn’t know how to wield his sledgehammer). More important than film school is the fact that the movie is fun to watch. Liu has great charisma and presence. When he’s fighting, his eyes are so intense that you imagine he didn’t even realize he was being filmed. And he’s good at conveying more than just fierceness, too. You can often see the gears turning inside his head, even without dialogue, and the resulting shift in mental focus. The fight scenes are competently choreographed, and the editing isn’t so fast that it hides the skill of the actors. Liu and his co-stars are good, and the camera holds on them long enough that you can tell they aren’t cheating. The movie was shot largely on a set, but the set is very good, and the costumes (often on crowds of hundreds of extras) are excellent. The movie convincingly transports you to ancient China. The final fight breaks out of the studio and takes place on a gorgeous, lonely, summery hillside. Even if you’re not a huge fan of kung fu movies, The 36th Chamber of Shaolin is an excellent, palatable example of the genre that just about anybody can enjoy. There are a lot of extra features, including interviews with Gordon Liu, film scholars Andy Klein and David Chute, and über-fan, The RZA, of the rap group Wu-Tang Clan. Unfortunately, most of these interviews overlap with one another. Recurring topics include the history of the Shaolin temple, the studio system under which the film was made, and Liu’s background and entree into film (this was only his second movie). The most interesting interview is with The RZA because he offers a more personal point of view. The other interviewees have done their homework, but they sound like the read same Wikipedia article. RZA tells us about his own reaction to the film and what it was like being in the audience in the late 1970s in New York. The best extra feature is probably the audio commentary. RZA and Klein team up, and except for some dry spells in the middle, they make a wonderful pair. Klein talks about the film in the context of other films, while RZA offers the fan-boy perspective. Both men love the movie, and they each come at it from a different direction, making their commentary track one of the better ones I’ve heard this year (not a huge compliment, but still...). The picture quality on this DVD is excellent. There is not a blemish to be found, and the colors are so vibrant they jump off the screen. For a 30-year-old movie, that’s surprisingly good. The movie has been on DVD before, and I don’t know if previous versions are as good-looking — I’d be curious to find out. The Shawscope widescreen reveals its origin, with the occasional squished image on the outer edge of the screen, but that’s not a flaw in the transfer; just a charming reminder of the analog nature of film. The DVD is enhanced for 16:9 TVs. The sound is monaural, but the quality is very good, considering its age. The subtitles have a few typos. They’re easily overlooked, but they make an otherwise exceptional DVD seem flawed. If you haven’t seen the movie already, watch that first. Then watch the interview with The RZA, and one other interview of your choosing. That’s it; you’re done. If you have seen the movie, you’re probably watching it again because you’re a big fan. In that case, turn on the audio commentary to see if you’re as smart as the two commentators. Afterwards, watch all the extra features except for the gratuitous Wu-Tang Clan music video. Then force your reluctant friends to borrow the DVD.